Self exists, so do the light and shadow. To give up clinging self is to dispel the shadow. To simplify, everything there is could be labeled as energy. Everything transforms constantly to recycle itself. When we perceive that change, we could label that as “death” or “end” or “not being the same,” etc. To simplify, everything could be labeled as light manifested in different intensities through different beings. All of them unique. There is no “source” behind those manifestations. “Charlie” is a manifestation of that light. He is a human being. When Charlie realizes that he is different from everything, an individual, that point is historical: A shadow is created from that light. That shadow will solidify itself as that consciousness of individuality strengthens. 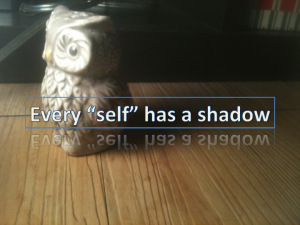 That sense of self is a psychological shadow created with our own mental energy. Obviously when Charlie “dies,” that shadow will remain. It does not need a body to survive. “This is the way I am.” That is a shadow.